A group of high school students from Yankton High School had an eventful day September 5, 2018. The group of students was tasked with framing the exterior of a 1600 sq. ft. house in one day. Impossible? Not at all — with Enercept SIPs. 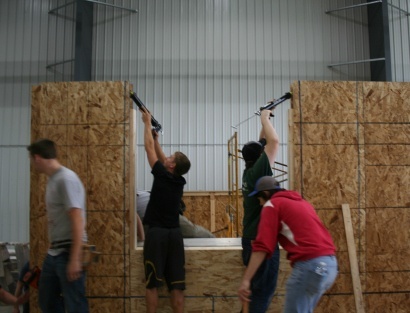 The wall panels for the three-bedroom, two-bath home were installed in a matter of hours, even with planned delays which allowed students in other trade-related classes to view the progress later in the day. 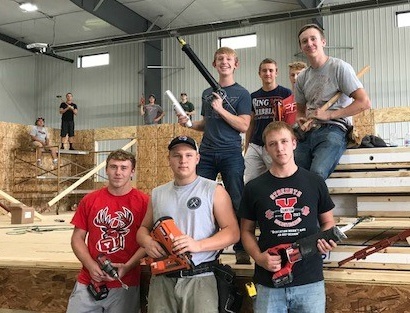 Led by the district’s Career & Technical Education Building Trades instructor, Bret Johnson and Josh Barber of Brookings-based JBar Construction, the crew of 10 high school seniors installed the entire exterior perimeter in about five hours. The subfloor was prepared, and sill plates mounted before panel installation began at 8:41 AM in the school’s large shop, located a short distance from the high school. The first wall was completed just 57 minutes later; the fourth and final wall was started at 11:40 AM. Sawtell said his interest in construction was sparked by doing projects at home with his older brother, who’d previously taken Johnson’s class. So, when he was presented with the opportunity to explore the trade, he did. “I did some cabinetry, so I figured this was the next step,” Sawtell said during a quick break between panels. This was Yankton School District’s second SIPs project; Johnson and his class built a similar home last year using Enercept panels. Last year’s project home was sold via sealed bid, and that’s the plan this year as well. Johnson said he wasn’t aware of any other area schools building project homes with SIPs, but he had heard of some schools in Wisconsin using them. Both Barber and Johnson pointed out that using SIPs for the house’s shell gives students a unique experience and exposes them to a different approach to building. The interior walls are still stick-framed, so they learn those techniques as well. Barber, with 21 years of experience and hundreds of SIPs projects to his credit, explained a bit of the history of SIPs and as well as showing the students many of the tricks he’s learned over his years of working with panels. The students quickly caught on to the basics, relying on Barber and Johnson for advice as needed. The students — just two of whom had worked with SIPs on last year’s project — promptly gained steam. Working together with Barber at first, they were soon adept at setting panels, navigating the trimmable corners, cutting or drilling openings in the sill plates for plumbing and electrical chases and sliding in header pieces with ease. Midway through, the crew was slightly ahead of schedule compared to last year’s class, which seemed to be a motivator for the students. Last year’s class had several more students, but the smaller crew was every bit as efficient. 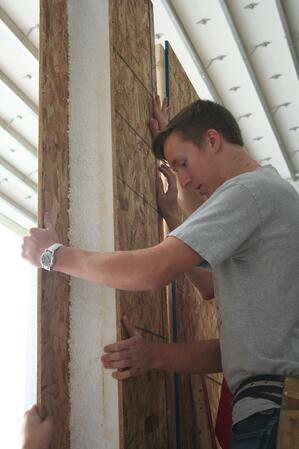 Joe Hebda helped build last year’s project and is back in an apprentice role this semester. He said his previous experience helped make the process easier this time and he chose to primarily man the sealant gun as well as help place and brace panels. Trevor Hanson said he’s been interested in construction since he was a small child. He’d never seen a SIP before, he explained. He’d heard the materials had arrived for the project and took a few minutes to stop by the site to have a look. primarily man the sealant gun as well as help place and brace panels. “I said,’What the heck is that?’” Hanson joked about first seeing the neatly-stacked piles of panels, which were not what he was expecting. But Hanson and his classmates soon picked up on the technique and worked to take in as much information as possible while helping with each step of the process — sorting panels, applying sealant, moving panels and headers into place. He thought the day went well. The team finished up the perimeter of the home in five hours, Johnson said. Enercept offered a reduced price on the panels used in the construction of this home, demonstrating commitment to the future of Enercept and the SIPs Industry by sharing the values of SIP Construction with the builders of tomorrow. The Career and Technical Education Academy (CTE) is an education program for high school students which is designed to educate and prepare students for future success by providing specialized, career-oriented learning. 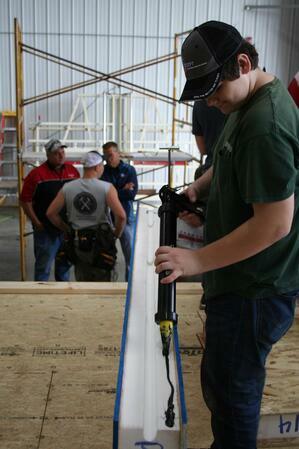 Building Trades is one of the courses presented through Yankton School District’s CTE. 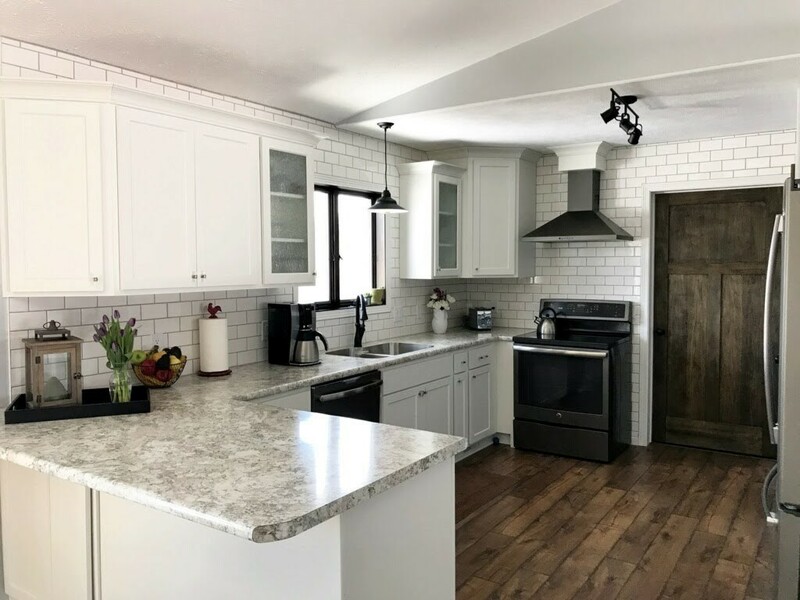 Yankton CTE students built this house in 2017; it was sold through sealed bid and is now home to an area family. 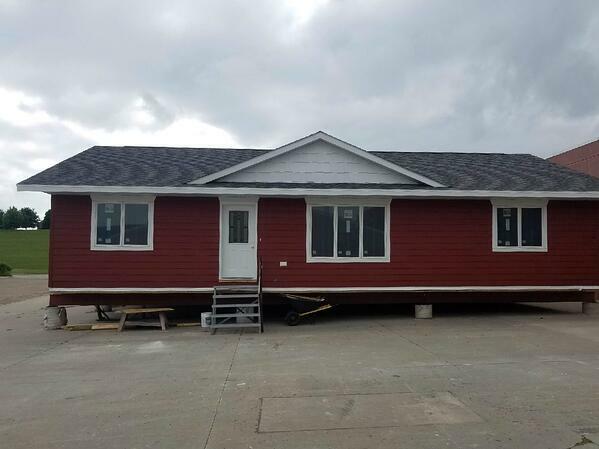 When you build with Enercept SIPs we provide a building that will go up faster and will be warmer, tighter, stronger, quieter and more cost-effective than conventional construction. It is a commitment that others simply can’t beat!